A few years ago I decided that I wanted to search out some of the cool cars that I remembered from the past here in Perth, and find out where they were now. Did they still exist? Were they in good nick and did the original owner still have them? So many great vehicles have been built and then ‘forgotten’ about in Perth. In my opinion, quality and good taste will always stand the test of time. 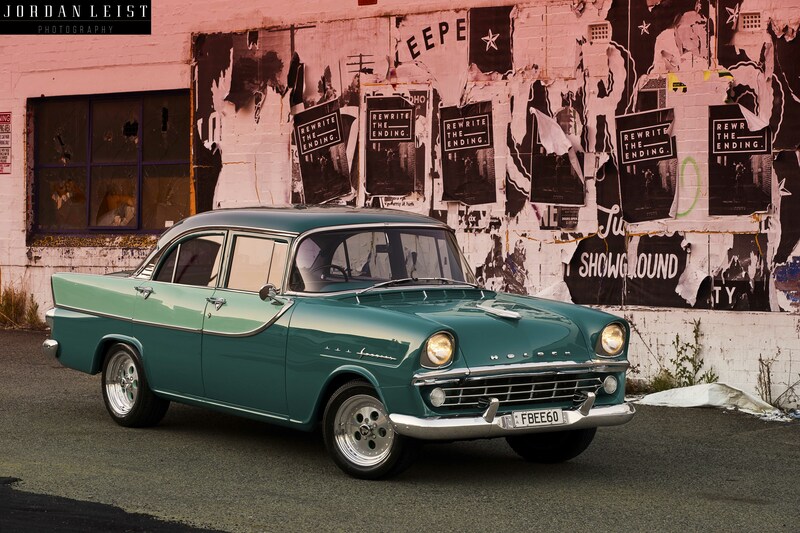 When I ran this idea past people in my circle, certain cars and names were recalled, and one kept coming up in conversations – Tony Merendino and his 1960 FB Holden. The car was massive back at the height of the car stereo craze in the early 1990s. Tony was the first guy to take a show car and fill it full of high-end audio gear and compete in the competitions known as the ‘Mega Cranks’. “The FB really stood out against the daily cars and the run of the mill stuff at the time. People were always drawn to it because it was old and cool and so different from the modern rigs fitted with stereos. It was more than just a car with some speakers slapped in it” Tony told me. Well before the audio side of things was important, the desire to build a quality car was on the list of priorities for a young Tony. He snapped up the car in 1984 from his Aunty for a measly $500 after it was originally bought by his Uncle, brand spanking new in 1960 from City Motors for, wait for it, 750 bucks. You wouldn’t even be able to get the bumper chromed for that price these days. Anyway, Tony got to driving the car with his mates and enjoying it for what it was until one day, he pushed the old grey motor a little too hard, and she bit the dust in a cloud of smoke. That fateful moment resulted in the full rebuild of the FB. Uncles, Tony and Charlie from Crisafio Motors lent their mechanical know-how and built a new motor and freshened up the entire driveline. The rest of the underside didn’t miss out either – Tony fitted Koni shocks and Lovell springs and made sure she was sitting low, well low for those days. Times have changed a fair bit since then. Without a doubt, a stand out feature of the car is the panel and paintwork. The car was painted in 1991 – that is 28 years old this year! It still looks impressive, not just in photos but in real life – dead set. It was the guys at Dalcos Panel & Paint that did such a fine job. A number of high-quality show cars wore paint jobs from Dalcos back in the day. They seriously knew what they were doing back then. The colours you may ask, all original, Sherwood Green and the lighter Collin Green. The FB still rolls on 15-inch Dragway Indys and sensibly sized Yokohama A008 rubber. These wheels were the first set of ‘mags’ that Stan from Hicraft Wheelmodz ever sized up and sold to a customer using his own unique, technical measuring system – something that Stan the man is extra proud of today. Tony made the custom centre caps himself by using some bonnet badges off a VP Commodore. Inside the car is a whole other story and a good one. Want to be impressed? The interior is completely original, by that, I mean exactly how it rolled off the showroom floor for Tony’s Uncle, 55 years ago. See what I mean about quality – it stands the test of time. A few minor repairs here and there and it was perfect. Tony had a complete set of brand new, tinted glass fitted to the car for the finishing touch to the two-year rebuild. It was Bruce Johnson from Westside Car Audio that did the first installation back in the early ‘90s and was undoubtedly the catalyst for the many improvements over the years. “From where it started and where it finished in sound performance were two very different levels. It was never created to blow your eardrums but rather sound awesome. I call it my Sydney Opera House. The roofline reflects the shape, and it sounds incredible” Even to this day the sound is spot on. “The car ended up having 16 speakers that ran off 16 channels from 4 different amplifiers. It is a fully active system and was well and truly ahead of its time back then. It was all Alpine gear that I used, even down to the processing units. The only different components that I opted to go for were a pair of 12-Inch Kevlar woofers from Orion because Alpine didn’t have any decent subs back then” Tony was very particular about how he wanted the system to look and it as imperative that nothing jumped out at you. “I made sure that all the speaker grilles were colour coded in their places and I even painted the amplifiers to match the car. The boot was mostly my work too. People loved the gear in there” You can see why the car won pretty much every show it went into – back then, it was untouchable in the audio department.